"Beurres composés", French for compound butters, are blends of butter mixed with other ingredients, such as fresh garden herbs and spices. Compound butters are traditionally made with pure butter, but a healthier version can be made using lower fat spreads like Smart Balance. Smart Balance makes different spreads. My favorite is Heart Right Light because it contains plant stanols, Omega-3 and Vitamin E. Compound butters are often frozen - they unthaw quick - making it all the more convenient to have gourmet butter pats available at any time. 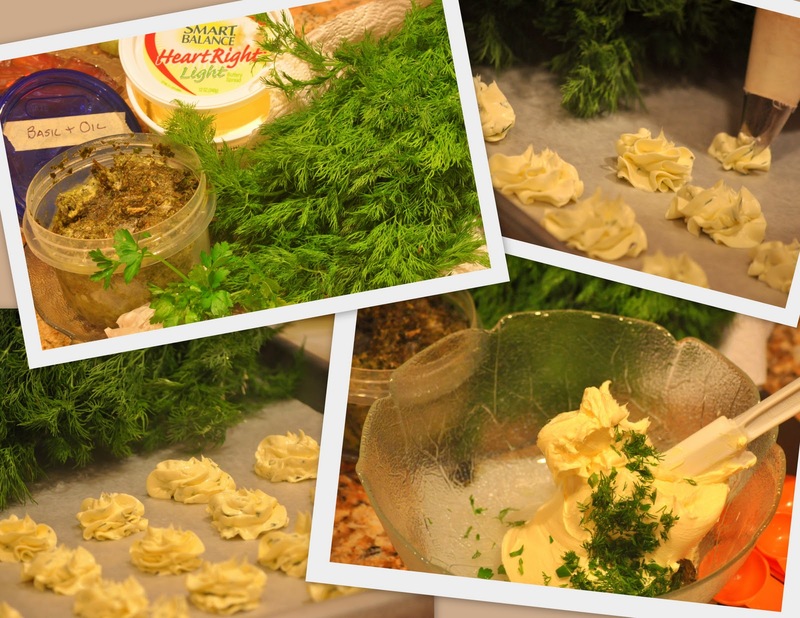 Compound butter blends can be used to flavor fish, chicken, meats, vegetables or in finishing sauces. I made my first compound butters with herbs and garlic at the Academy of Culinary Arts, in Mays Landing, NJ. We made rosettes and froze them until ready to serve. They really added a nice touch of elegance and flavor to the breads and dinner rolls that we served in Careme's, an upscale, fine dining restaurant. DILL Cut dill at its peak. Wash and wrap in a paper towel and seal inside an airtight plastic baggie and freeze. When you need fresh dill just slice off whatever you need. BASIL can also be preserved at its peak by whizzing it in a food processor with olive oil. Label and store in freezer. Use basil in oil just as you would fresh basil. 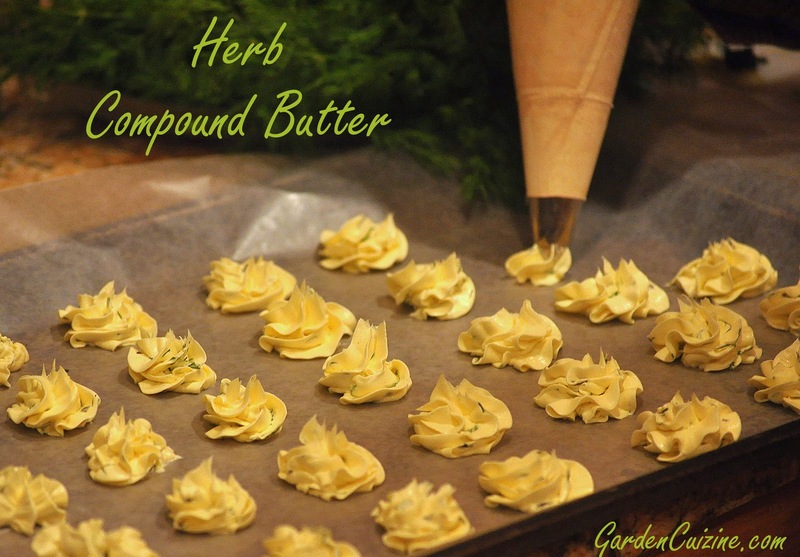 Compound butter adds a special touch to holiday and special company meals. This is the recipe I used for Thanksgiving. You do not need to follow exact measurements for compound butter. Use this as an idea. Be creative and add whatever you have available. Simply soften butter at room temperature, or if using Smart Balance buttery spread, it will be soft enough straight from the fridge. Mix in chopped herbs of your choice. Make rosettes or mold into logs or squares and freeze. To avoid clogging the tip in the pastry bag if piping out rosettes, try not to use stems or big pieces of herbs in your mixture. After mixing the herbs into your soft buttery herb spread, put the blend into a pastry bag with a large star tip and pipe out individual rosettes onto wax-paper-lined plates or sheet pans and freeze. Once frozen, the pats can be combined together in airtight freezer containers or freezer baggies. Smart Balance spread is softer than butter; serve them directly onto your guests bread plates rather than onto a separate serving plate, about 10 minutes before dinner is served. The soft buttery herb spread could also be formed into a log by rolling in parchment paper, wrapped in plastic wrap and frozen until firm. Or on a lined baking sheet press the spread into a smooth, even 1/4-inch thick square or rectangle block, cover with wax paper or clear wrap and freeze. When ready to use, slice and use in cooking or serve as you would butter. Photos and blog post Copyright Wind. All rights reserved.